Lae Nani 415 - Amazing Oceanfront Condo - 2 BR & 2 BA - Sleeps 6 - Ground Floor! 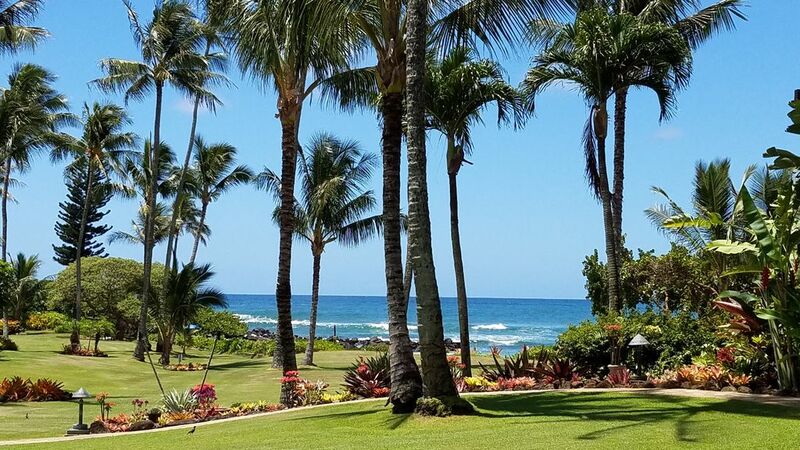 At Lae Nani, you'll feel truly relaxed, surrounded by lush tropical landscaping and the sound of ocean waves breaking on scenic Wailua Bay, only 10 minutes from the airport. Ocean view, ground floor unit allows one to step off the lanai onto a grassy lawn leading directly to the beach. The beach includes a rock protected pool at one end, ideal for small children. Large two bedroom, two bath, full kitchen completely remodeled with granite counter tops. Living area with attractive Asian decor, complete with new Flat Screen HDTV, Cable, Smart Blu-Ray / DVD player, WIFI and stereo sound system. Gas barbecue, lighted tennis courts, resort laundry facilities are onsite. Condo easily accommodates four adults with a king-size bed in the master bedroom and two single beds that can be made into a King bed in the second room. All beds have new pillow-top mattresses. Bathrooms are all new with granite counter tops and new fixtures. Lae Nani does not have A/C. Typically the tradewinds provide nice cool breezes through the units and ceiling fans assist. The louvers in the guest bedroom can be opened along with the louvers in the ocean facing parts of the condo to allow for the flow of air. NOTE: We highly recommend the purchase of "Trip Insurance" for your total vacation expenses as the cancellation policy will be strictly enforced. For years we had been visiting and staying at Lae Nani in Kapaa Kauai. We became very fond of the Lae Nani property itself as well as the central location on the island. We enjoy the sun, surf and beauty Hawaii has to offer and being a family of avid scuba divers we decided that we wanted to have our own home away from home near some of the best diving! This is a vacation home for our multi-generational family to visit and enjoy. Its location on the property and being on the ground floor allows the best access for both young and old! We love having a great, quiet beach just outside our doors and as I mentioned, being centrally located on the island makes it so convenient for sightseeing and exploring the island. Both bathrooms recently remodeled with granite counter tops and new showers. WiFi access to Netflix, Amazon Videos, Pandora, etc via your personal account access. The landscaping at the Lae Nani is spectacular! Our stay in #415 was so pleasant. The beds were comfortable. The kitchen had everything that we needed. It was nice at night to be lulled to sleep by a water feature that is very close to this condo. We spent a lot of time on the lanai enjoying the view. We liked being within walking distance to restaurants and the Coconut Marketplace. The pool on the property is well-maintained. The tennis courts are a bit rough, but our kids still had fun playing tennis. The owner was very quick to respond if I had any questions and also took the time to email us to see how things were going with our stay. The gridlock that was mentioned in another review is a bit of a pain, but if you plan to stay in the Wailua/Kapaa area, we would highly recommend this condo. Maybe we expected too much. I’m reluctant to give a less than satisfactory review because the owner was so responsive, and genuinely seemed to care. However, there were several reasons for the low review. court. Once we viewed the front of the unit, it was quite pleasng with good view of the ocean and well tended open space. However, other than a protected kiddie swimming beach and area, the ocean was unprotected, and not great for swimming. You do have the option of going to a state beach with life guard a few blocks away. loudly heard every time they moved around their unit. road leading to the complex. We wanted to explore the island but were very limited because of the unnavigable highway. were content to stay on the grounds it wouldn't be an issue. There were several good restaurants within walking distance. The unit itself was adequate, and had all the accoutrements for a comfortable stay. Coming back to Lae Nani was a joy! Early December works great for us - after a busy Fall, and before the holidays - perfect for a laid-back vacation. We enjoy that the condo is walking-close to shopping, restaurants, and scenery. The lanai is my favorite place to read and watch the birds. This trip we didn't venture far for sightseeing, although we have in the past. The condo is so well decorated, and after having been there a few times, feels like home away from home, so we just lounged a lot. We always comment on how well manicured the grounds are at Lae Nani. It is just perfect! The new roof and paint just makes everything look so well cared for. We look forward to our next trip. The apartment is perfect, really spacious and clean. The location is so convenient. We spent there only four days with our two little kids. The beach was perfect for them as much as the grass area in front of the apartment. We made a mistake with the gate code and we called Jim around midnight. Even if it was late and we didn’t write down the right infos, he was still super nice and helpful. We would for sure come back. But I need to say that there is a problem with this apartment. When you are there, you don’t want to leave!!!! Central location near the airport and convenient to most activities on the island. Taxes: All rates are subject to an Accommodations Tax and Hawaii Excise Tax which totals: 14.25% (10.25% Hawaii Transient Accommodations Tax and 4% Hawaii Excise Tax) Holiday Rates: Holiday rates may apply for certain seasons, please contact us for more details. Cancellation Policy: We understand that events outside your control happen yet we have to draw a line in the sand somewhere...here is our line in the sand pertaining to cancellations. Cancellations made more than 60 days prior to arrival date will be refunded 100% the security deposit. Cancellations made less than 30 days prior to arrival date will forfeit the security deposit if we are unable to re-book the accommodations. Credit cards are accepted - a processing fee of 3% will be added to the amount of rental. No processing fee when paying by check.